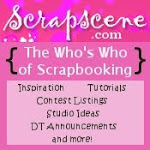 Now here's a quick and easy project you can whip up in no time at all. This time of the year always makes me think of baking Christmas cookies with my mom and grandma. 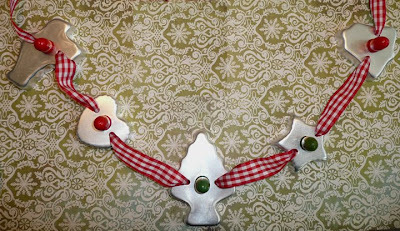 Well, once you are finished rolling out the cookie dough, you can make this cute little garland to use as a decoration for your kitchen or on your Christmas tree. 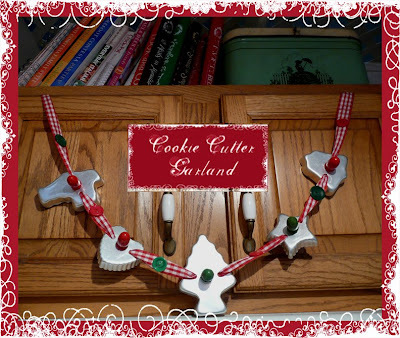 * Cookie Cutters - These can be vintage cookie cutters or new ones. I bought this set of six vintage-looking cookie cutters at Homegoods for $7.99. 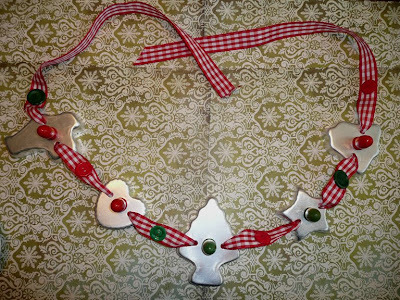 I like to use an odd number of cookie cutters (I used 5 of them for my garland), but you can use as many as you like. 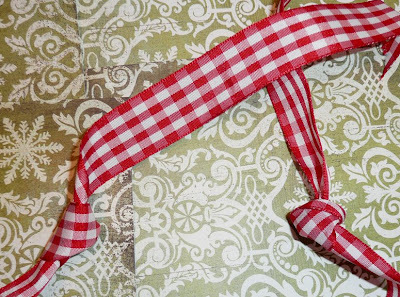 * 48"-54" of ribbon - I used 7/8" wide red gingham. 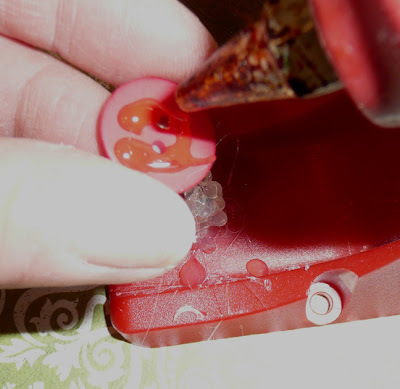 * Red & green buttons - larger buttons work best for this project. I used 3/4 " diameter buttons. * Glue gun and glue sticks. 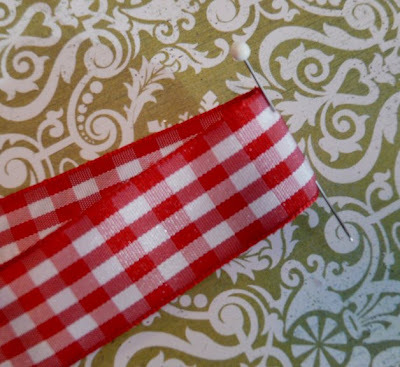 Fold ribbon in half and mark the center with a straight pin. 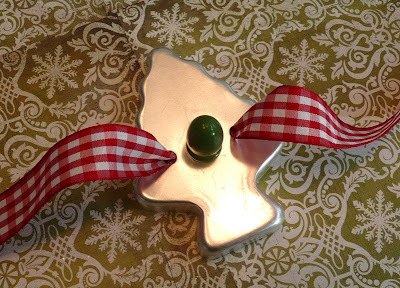 Figure out which cookie cutter you are going to use for the center of the garland. Thread the ribbon through one of the holes in the cookie cutter, starting from the front and going to the back of the cookie cutter. 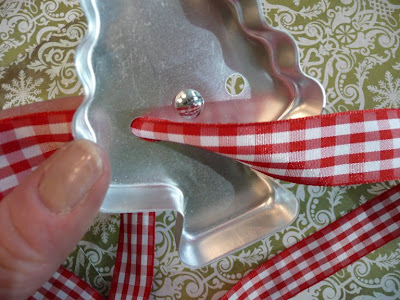 Then thread the ribbon up through the other hole, from back to front of cookie cutter. 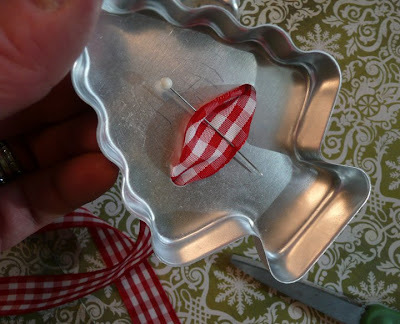 Center the cookie cutter on the ribbon by using the straight pin marker as a guide. At this point, your garland should look like this. Continue to string the cookie cutters on to the ribbon, spacing the cutters evenly along the ribbon. Apply a dab of hot glue to the back of one of the buttons. Center and glue the buttons to the ribbon midway between the cookie cutters. If you prefer, you can sew the buttons to the ribbon using needle and thread. Tie a knot near the end of each ribbon. Hang your garland on the Christmas tree, or the fireplace mantle, or from a small kitchen tree or wherever you want to add some holiday cheer! 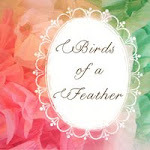 Don't forget to post a picture of your garland (and other projects) on the Joli Paquet Flickr site, so we can see all of your wonderful creations. Don't forget to leave a comment on the post below to sign up for the GIVEAWAY. 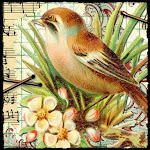 Be sure to periodically check back here and on the artist's blogs listed on the left ~ you just never know when another Joli Paquet event may be happening again here in blogland! Both of these projects are so cute and easy. I'm always drawn to those little tart pans when I see them in thrifts and now I can justify buying them. Great project! 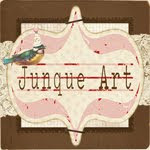 Love this one too Jeanne. You should work for a magazine. 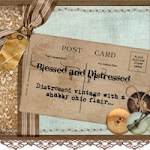 Love the shabby chic look! I have my Great GrandMothers cookie cutters! Now I have a way to display them. I never wanted to glue them to anything or do anything to alter them. I wanted to keep them intact. All the projects were just beautiful - my favorite was the snowman and snowman's top hat. Thank you for having this Christmas gift. I love this project!!!! This has been really wonderful, I am sad to see it go! I hope you all have a wonderful holiday season and Thank you so much for sharing your inspiring selves with us! Wow! This is so cute...and easy! I love it! Thanks for sharing your idea! I simply can't thank you enough for all of the wonderful ideas!!!! 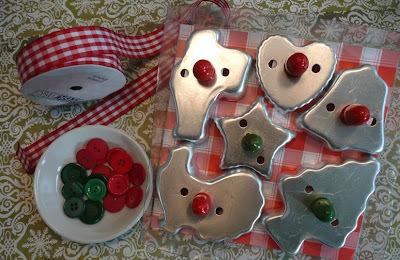 I have oodles and oodles of vintage cookie cutters...I've used them on my Christmas trees through the years as ornaments! I haven't used them as garlands, I don't remember those holes in mine! I'll look, other-wise I could just hot glue the ribbon on! I also didn't know they made the vintage looking ornaments now!